Sebastian Loeb had it all easy with his Peugeot at this year's Pikes Peak. Yes, it's true he broke the previous record by over a minute and a half, but at least he could hear what was going on in his helmet. The same couldn't be said about Eddie Rickenbacker. 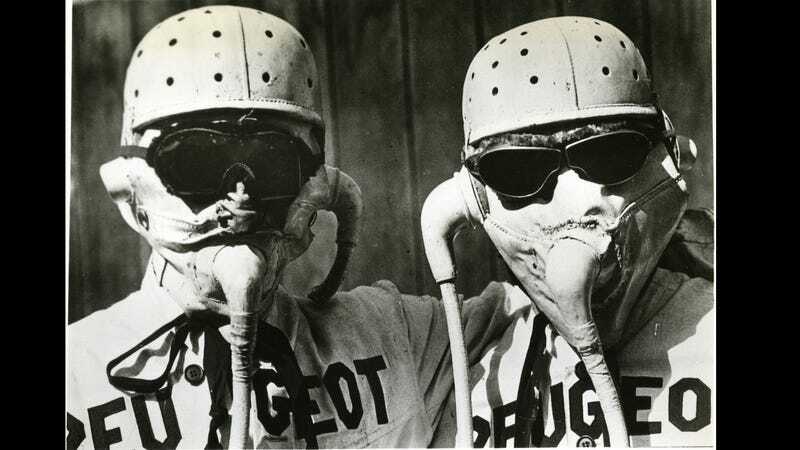 While driving for Peugeot, Rickenbacker invented a way to communicate with his riding mechanic over the roar of the engines by connecting two leather face masks together with rubber speaking tubes. While this worked well, he gave up the idea after deciding the masks were "unbearably hot and itchy." Our Latest Gemini Astronauts? No, not from our next projected space flight, but from another era, the two gentlemen behind the masked are Eddie Rickenbacker (r) and Fred McCarthy (l), driver and mechanic of a Peugeot race car during the 1914 Corona, Calif. road race. The use of leather face masks to protect themselves against flying pebbles necessitated the use of speaking tubes to keep in constant communication. With crash helmets and dark goggles, their appearance is truly "out of this world". In the early twenties, Eddie Rickenbacker also worked for General Motors, but the Sheridan brand he was involved with didn't really work out. After a long and adventurous life, he passed away in 1973 in Zurich at the age of 82. And before you would ask about the guitars...yeah, they were cousins. Source and photo credit: Auburn University Digital Library and David Salafia.